Hot Chip's new album Made In The Dark is already MixMag's Album of the Month for January 2008 and it hasn't even been released yet. So have you heard of Hot Chip yet? If you haven't, you will this year. Made In The Dark is Hot Chip's third full length release and the follow up to their critically acclaimed album The Warning. Here are some of the initial reviews I found on floating about on the Internet. Made in the Dark (The Album) is out in the UK on February 4th (February 5th in the US) and the first single of the album, Ready For The Floor is released on January 28th. If you visit Hot Chip's website you can download a free mp3 of the title track of the new album for free or visit their myspace page for more tunes and make up your own mind. I love all that I've heard off the new album so far - I'll post the video for Ready For The Floor in a mo. Some nice poppy tracks that give me that 'bounce around the flat feeling', I'm looking forward to hearing it out and about. And if you miss them at all of those the line up for Coachella 2008 in Indio California has just been announced and they are there on Saturday April 25th! Some info on Hot Chip US tickets here and UK tickets here. When I've heard the new album in full, I'll let it sink in and share my thoughts in the next couple of weeks. 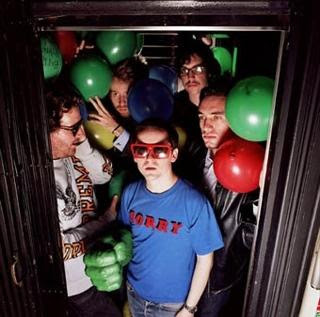 Do Hot Chip do it for you? Leave a comment, would love to hear from you.